I love cookbooks. I have a VAST selection of cookbooks, and I mean massive. Over 100 cookbooks (on the last inventory). I’m one of those “PEOPLE” that mossy over to the local bookstore, pick up about 10 books, sit at the café and drink tons of overprice coffee and look through them, mark them, and then run back home to order them in Amazon. So, when I picked up Rose’s latest book, Heavenly Cake, I thought it must be good, I had The Cake Bible from ages ago. And as I sat there browsing, I opened it up and landed on this specific recipe. Background information: I love nuts (the eating kind, not the people kind) I mean all kinds of nuts: walnuts, hazelnuts, almonds, cashews, peanuts, and on and on. I don’t think there is a nut that I don’t like. Pistachios? Well pistachios are my holy grail. I would live on them, except for the fact that they are EXPENSIVE little suckers. We splurge at least once a month and buy a big bag (2-3 pounds) and keep a tight leash in our consumption (we want to make them last as long as possible). So when I saw this on the book, I bought it right there and there. Rose’s just so you know, I paid the inflated price of $40 bucks at the BOOKSTORE! You had me at “Sicilian Pistachios”. When I joined the HCB group, I looked over their list of already baked cakes and hoped that they had not gotten to this one. And Yeah! For me, they had not. I made a request with Marie and bang! There it was, in the calendar. Now, I had to wait. I had planned to order the pistachios from Rose’s recommended supplier. But last week we had family visiting and between feeding and hosting over 20 people this planned task felt down the list, and before I knew it was too late to do so. So, I went to the local Middle Eastern markets and was not satisfied with their selections, which were in-shell pistachios. I knew that I needed to blanch them before hand, which was going to be an extra step and I did not want to be sitting there opening them one by one too. I ended up at Whole foods and found a bag of shell pistachios from california – Score! I knew that the cake was easy to do, so I was not worried about time. 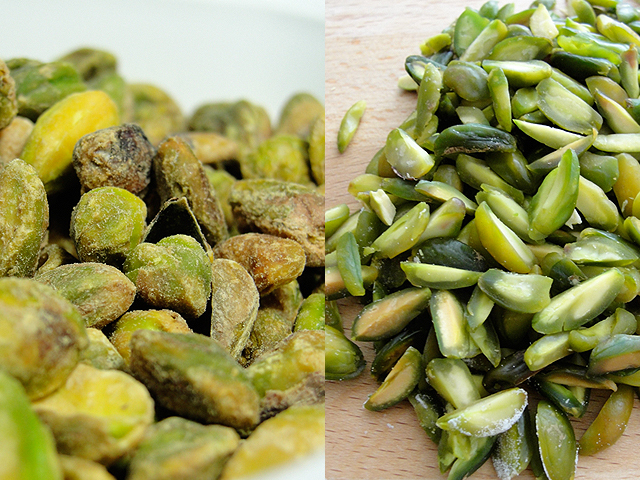 But, I had to do the extra step of blanching my pistachios before hand, so on Saturday, I started early. Have you ever blanched nuts? TWO WORDS: Nasty business. And it took forever to clean them up and once that was done, I put them aside to let them dry up for up to 3 hours as recommended. Came back 6 hours later. 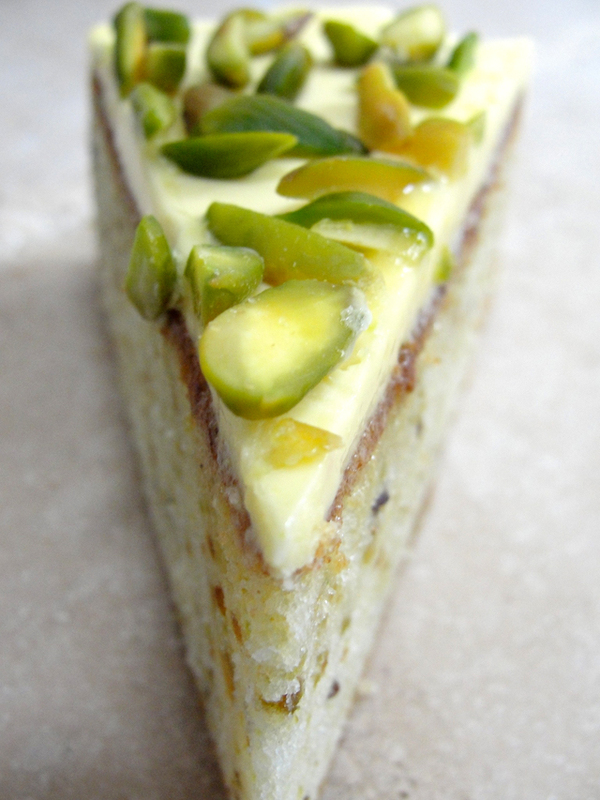 With no new house in the horizon and still-moist pistachios. Since I knew I needed to pulse them with the sugar, I was afraid that if there were even a tiny-itsy wet, I was going to end up with a paste. So I decided to pop them in the oven and give them a quick toast. Problem solved. Then I sat and selected the greenest ones out of the bunch for topping the cake. The others went with the sugar in the food processor for a quick mix up. The cake batter took less than 10 minutes to put together. And after weeks of light airy cakes, this dense texture was a nice surprise. And it really needed to be spread out and smooth with a spatula in my baking pan, which was encircled with my brand new cake strip. Major bowl/spatula licking action took place afterwards. Mine took 45 minutes to bake into a golden brown. Out it went to rest up for 10 minutes and then flipy-floppy out of the pan and unto the rack to cool off. And onward to tackled the Golden Neoclassic Buttercream. I went into this step a bit apprehensively. 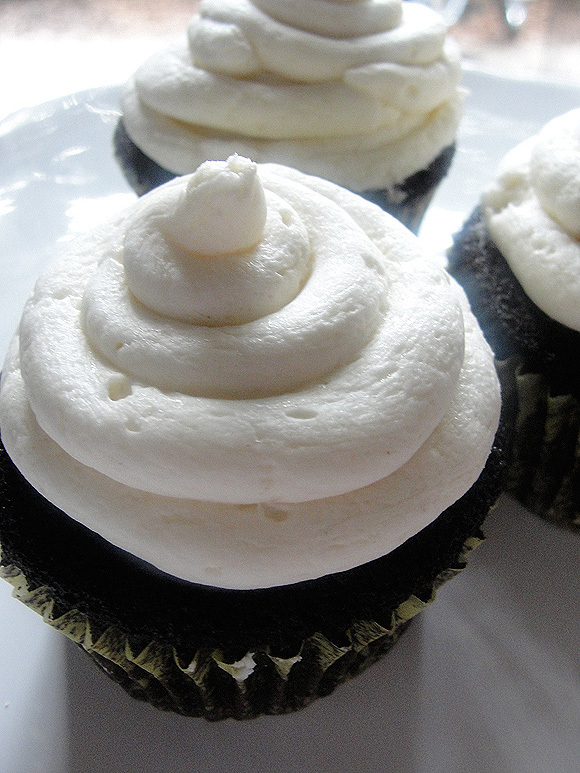 Buttercream and I have a love-hate relationship (sort of like piping). So, I took a couple of deep breath, read the instruction one.more.time and carried on. I used light corn syrup, because I was too lazy to go on the hunt for the golden syrup. And lime juice instead of lemon, because well, that is what I had at hand (please refer to lazy factor above). I also made sure I had all of ingredients lined up and ready to go. And even with all that prep work. I messed up on the hot syrup. By the time I realized it, I was too late. I was pouring into my previously beat yolks in a steady stream, with my handheld mixer and noted that I was making cotton candy. My syrup had gone over to the “Hard-ball stage” during the cooking. So I found myself with bits of hard sugar specks in my buttercream. I would have, except that I had 2 eggs left. I decided to keep on and see the end results with the butter incorporated and if it was too much of an issue, I would redo. After beating the butter in… it came together as it should (with my hard sugar specks) and I decided that it was good enough. Instead of pistachio essence, I added almond extract, and omitted the vanilla that the recipe calls for. Before I frosted the cake, I placed the buttercream in the refrigerator to cool it a bit, then spend 15 minutes trying to get as smooth a surface as I could. Back in the refrigerator it went, while I diced up my pistachios stash for the topping. All the while thinking..."NEXT TIME ORDER THE SLIVER PISTACHIOS AHEAD OF TIME!" 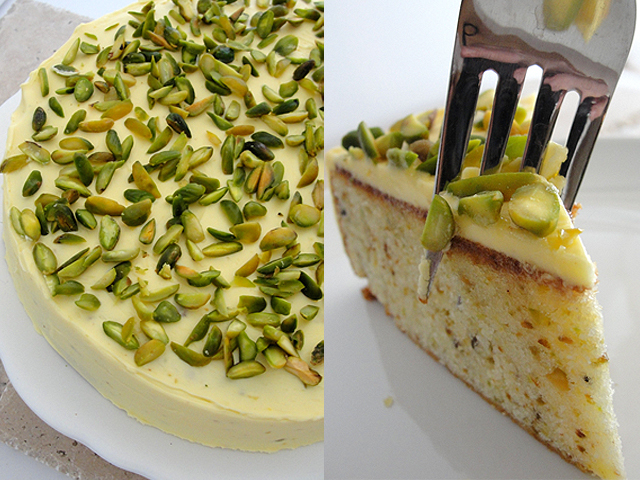 Took the cake out and sprinkle my sliver pistachios all over. Was it as brilliantly green and spectacular as Matthew’s? No, but I was totally satisfied with it. Tom: “Much denser than the previous cakes, I like the nutty texture on it. This one stays here, no sharing!" 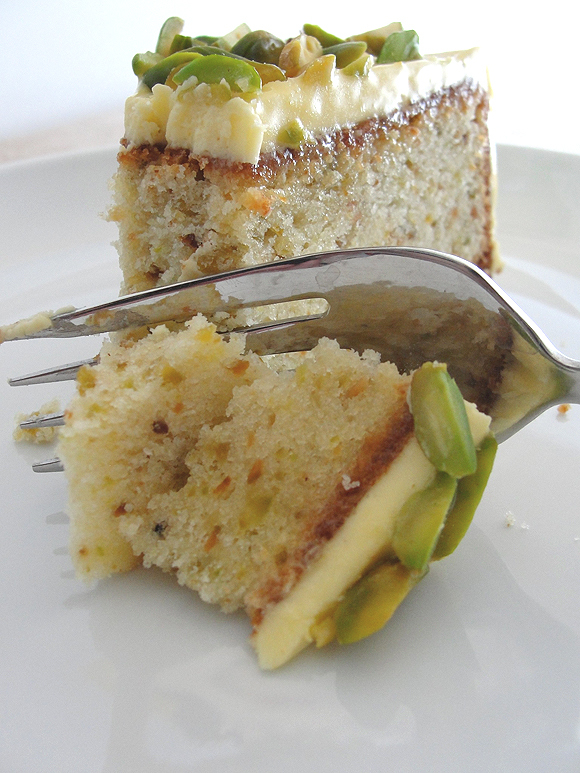 Me: I really like this cake; love the pistachio flavor, even thought I would have loved it to be a bit more pronounced. 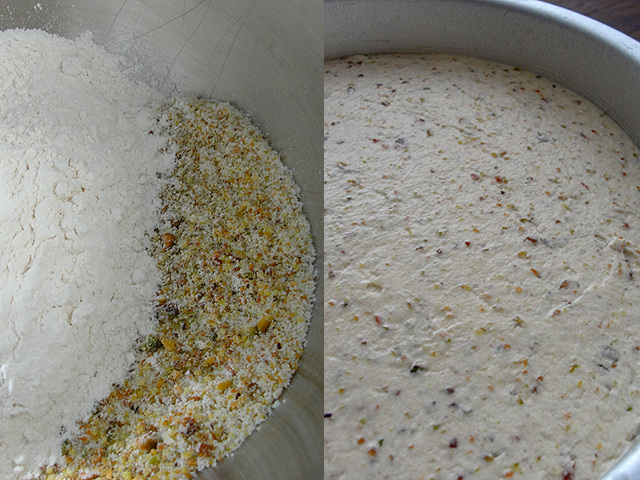 I’m thinking next time, I’m going to use pistachio flour and see if that would change the flavor or texture and give it a bigger pistachio punch. This one goes on regular rotation for future baking.